Digital Clock manufactured by our company are suitable for all industrial, office, banks, brokerage houses, stock exchanges, pharmaceuticals plants, airports & currency exchanges, railway stations & similar applications. The GPS (Global Positioning Satellite) Clocks are available in Standalone & Synchronization versions. The GPS Clocks find immense use in Railways, Banks, Stock Brokerage Houses, Commercial Complex, Office Complex, Production facilities, etc. Standalone Clocks come with the option of GPS Time Synchronization using the GPS Satellite signal. GPS Clocks manufactured by Ace Instruments are suitable for all industrial, office, banks, brokerage houses, stock exchanges, pharmaceuticals plants, airports & currency exchanges, railway stations & similar applications. GPS Clocks (Global Positioning Satellite) are available in Standalone & Synchronization versions. GPS Clocks find immense use in Railways, Banks, Stock Brokerage Houses, Commercial Complex, Office Complex, Production facilities, etc. Standalone Clocks come with the option of GPS Time Synchronization using the GPS Satellite signal. GPS Clocks can be custom designed to display the time of India, US, UK, Germany, China, Japan & any other country required. Time is accurately maintained even in the case of power cut by virtue of built in battery backup for time storage in memory. GPS Clocks manufactured by Ace Instruments are suitable for all industrial, office, banks, brokerage houses, stock exchanges, pharmaceuticals plants, airports & currency exchanges, railway stations & similar applications. GPS Clocks (Global Positioning Satellite) are available in Standalone & Synchronization versions. The Standalone Clocks come with GPS Time Synchronization using Satellite Time from the GPS Satellite acc. Wireless Synchronized Clocks are Synchronized Digital Clocks with Master & Slave Communication over Wireless RF. These are high accuracy Digital Clocks with a Master Clock ( with GPS Time option), which communicates with up to 120 Wireless Slave Clocks over Wireless Radio Frequency (RF). The range of communication in the Mesh Network is up to 1 Km. line of sight. The communication between Master to Slave & Slave to Slave Clocks is in Mesh Network & hence the Master Clock can be away from the Slave clock up to 1 Km in distance & yet show synchronized time. Option of wired RS 485 communication is also provided for difficult to communicate areas & restricted areas. Wireless Synchronized Clocks find application in Defence, Pharmaceuticals, Clean Rooms, Hospitals, Hotels, Brokerage Houses, Stock Exchanges, Currency Offices, etc. Hospital Clocks are direct wall mounting or modular wall mounting clocks with high intensity displays in options of sizes 1", 2.5" & 4" Height. 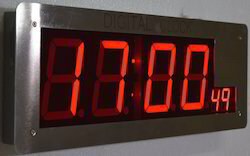 Hospital clocks are available in both HH:MM ( 4 Digits ) & HH:MM:SS ( 6 Digits ) version. Aesthetically designed with Front Flush Stainless steel Plate & 45 mm. depth for fitment into modular walls or hospital panels. Clean Room Clocks are available in both standalone version & master slave network clocks version that work on RS485 modbus communication/Wireless RF Communication. The slave clocks (up to 120 nos.) can be connected to the master clock via a 2 core communication cable multidrop network or wireless RF communication & the master clock time is synchronized with all the slaves. All the clean room clocks in the synchronized clock network show the exact same time right up to the seconds. Time is accurately maintained even in the case of power cut by way of integrated battery for time keeping. The master clean room clock is a 2" high super bright 7 segment display clock with 6 displays for hours, minutes & seconds. The slave clean room clocks have a 1"/2.5"/4" high super bright 7 segment red LED display with exceptional depth & clarity for visibility over a long distance. The slave clean room clocks can be at a maximum distance of up to 1200 mtrs. (1. 2 km.) & yet show accurate synchronized time, same as the master clock. The slave clocks are available in stainless steel outer plate enclosures for clean rooms & also flameproof aluminium lm-6 body certified by cmri, dhanbad for use in gas group areas i, ii, iia & iib. Ethernet clocks which will show your pc/ server time on the clocks in the network using a simple front end software to connect to ethernet are also available as optional. High accuracy of +/-1 second time is available in both standalone & synchronized version. In the master/slave synchronized clock system, GPS (global positioning satellite ) time can be maintained across all the clocks in the network by simply opting for GPS master clock. All the slave clocks in the synchronized network will then display gps time synchronizing from the master GPS clock. High accuracy of +/-1 second time can then be maintained across the whole production/plant/railway station. Wireless communication between master & slave clocks allow for cable free communication thus reducing installation time & effort. Synchronized Digital Clocks are industrial clocks suitable for display of uniform single time across the plant in Pharmaceuticals, chemicals, bulk drugs, hospitals & various other industry. ACE instruments make Digital Ethernet Clock Model AI-CL4-ETH is suitable for all Pharma Clean Room applications, Bulk Drug & Pharma API units, residential building complexes, hospitals, hotels, multistoried complexes, industrial, railways, airports, banks, software development companies & brokerage house applications. It displays the Ethernet Network time relayed over LAN using the front end software to load the TCP/IP settings. Time is accurately maintained by inbuilt memory battery even in the case of power cuts. In the event of Ethernet Communication failure, the clocks run on in-built high accuracy mode with annual drift of not more than +/-60 seconds. 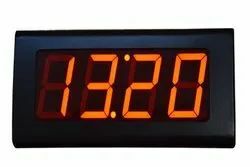 The digital ethernet clock is a 4" High Super Bright 7 Segment Display Panel with 6 displays, 2 each for Hours, Minutes & seconds (seconds display in 2" height ). The display used is a super bright 7 segment red LED Display with exceptional depth & clarity for visibility over a long distance. 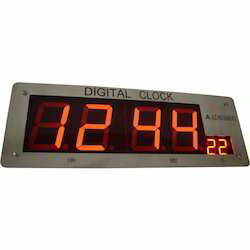 Looking for Digital Clock ?